Yesterday, Justin Kan took the day off from his streaming his life on the internet 24/7 via Justin.tv. He put a call out last week for a one day replacement and Pittsburgh video blogger Justine Ezarik (aka iJustine) volunteered for the job. Revver sponsored her trip out to San Francisco and she wore the camera all day on Tuesday. I ran into Justine and her friend Desiree Cramer (Justine and Desiree do the video blog “Mommy, pack my lunch”) yesterday at the Web 2.0 Expo and shot a few photos. While we were hanging out, Jeff Evans (aka gentlegiantjeff), and Brian (bdseattle) from Lobby 1 of Justin.tv’s chat room showed up. 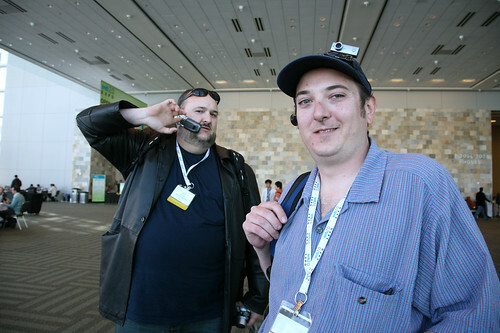 Ironically Brian was now wearing a hat mounted camera and streaming live via Ustream.tv, just like Robert Scoble, Jeremiah Owyang and Chris Pirillo have been doing recently. Even Johnny Ham, co-founder of Ustream.tv, is now emulating Justin.tv. One day soon we are going to be surrounded by cyborgs streaming their life online. 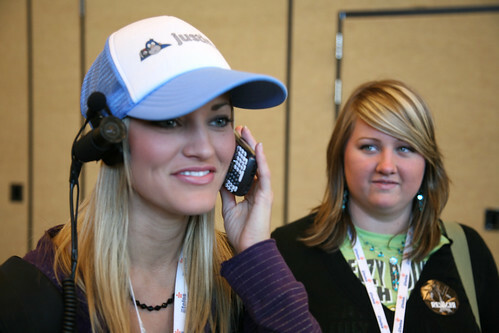 UPDATE: Here’s iJustine’s write-up of her experience with Justin.tv.